If you like good food, great music, and want to live in a big city with that good ol’ southern country feel, Nashville is the place you should call home. It’s a place where you can work for one of 400 leading healthcare companies and then take a tour of Jack Daniels’ distillery. You can go out for some of Nashville’s famous hot chicken and then play frisbee with some Vanderbilt students on one of the Greenways. It’s home to the world’s oldest radio show, Gibson guitars, and the Music City Miracle. If you want to move to another state and want that old Southern country feel in the big city, check out Nashville. Which Nashville neighborhoods are most affordable? Which neighborhood in Nashville is the best fit for me? How long is the commute in Nashville? How’s the walkability, bikeability, and public transportation in Nashville? Where can I find apartments and houses in Nashville? How much will it cost to move to Nashville? What’s fun to do in Nashville? And if you’re looking for more info on moving to Nashville, check out our Nashville move cost guide. With approximately 660,388 people, Nashville is the 24th most populous city in the United States. As of early 2018, the average 1 bedroom rent in Nashville of $1,371 per month, Nashville is the 33rd most expensive metropolitan area in North America in 2017. As any good realtor will tell you, the first step in looking for places to live in a new area is to set your target budget and maximum budget. In Nashville, $1,100 would be a sweet spot for your target budget. Based on the cost of living in Nashville, it’s the 32nd most expensive city int he United States. Now, before we get into the finer details of moving to Nashville, check out this video showing off some of the sights the city has to offer. Nashville has 20 neighborhoods. That’s not nearly as many as a big city like New York. 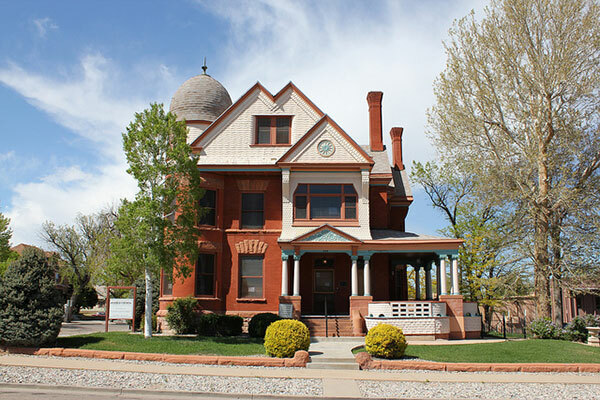 Like in all cities, each neighborhood has its own vibe and character, along with rental prices. This website does a really fantastic job of describing each neighborhood. And to help you better make sense of what exactly is going on in Nashville’s neighborhoods, we overlaid a rental hotspot map of the city with the neighborhoods above to give you a good idea of what the most expensive areas are. Towards the middle of the price spectrum, you’ll find Whites Bend, Four Corners, and Melrose, which charge anywhere from $1,000 to $1,500. The farther you get from from Downtown, places like Hermitage Hill, Glencliff, and Salemtown, are places where you can find an apartment for $700 to $900 per month. So let’s get this out of the way now: if you’re on a tight budget, look south to Berry Hill or west to The Nations. If cost is no object, look to Downtown, Midtown, or the Gulch. That perfect neighborhood could have a horrible commute. Be sure to figure out how you’ll get to work before you sign a lease or a mortgage. Nashville has been ranked the 31st most congested out of 100 metropolitan areas in the United States. That’s not terrible, but it’s not great either. Downtown Nashville is fairly easy to get to and from, with convenient access to three major Interstate systems (I-40, I-65 and I-24) and the Nashville International Airport. The worst traffic bottleneck in Tennessee is around the Interstate 40 eastbound interchange at exit 209 where highways 70, 40 and 24 can be accessed. When it gets congested, average speeds can go as low as 11 mph. Parking in Nashville isn’t as difficult as it is in some other major cities, and most metered spots are free after 6pm. Check out this parking guide for more. Though it doesn’t have a subway system and isn’t serviced by AMTRAK, Nashville MTA operates a bus system all over the city. Below is a snapshot of Nashville’s bus map. Music City Central (MCC) is Nashville MTA’s downtown transit station. It’s next to Municipal Auditorium and is bordered by 4th and 5th Avenues in the Downtown area. Imagine you’re taking a class at Tennessee State University and want to go out downtown. You could hop on the 29 bus and get off at 4th Avenue. Here is a huge guide and full map of Nashville’s public transit system. Bottom line: with a score of 23, the public transportation system is okay, but still not great. It can get you almost anywhere inside the city within an hour. If you’re not planning on having a car or riding a bike, you’d better get used to taking the bus, because you’ll be taking it everywhere. You can get by with a car, but a bike might be a better option for you. Nashville is bike friendly, and it even has a free bikeshare program! Why bike when you can walk? 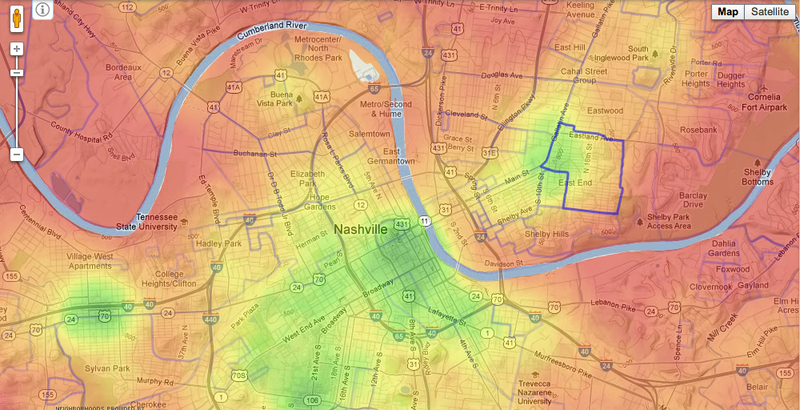 In terms of walkability, Nashville is very hot and cold. Downtown Nashville is very walkable, but other areas of the city like Berry Hill are not. If you’re planning on doing a lot of walking, you’d better check out apartments in Downtown or Midtown. Below is a walk score map, similar to the rent price heat map we talked about above. The greener the better. If you don’t like walking, stay away from the red when looking for neighborhoods to live in. 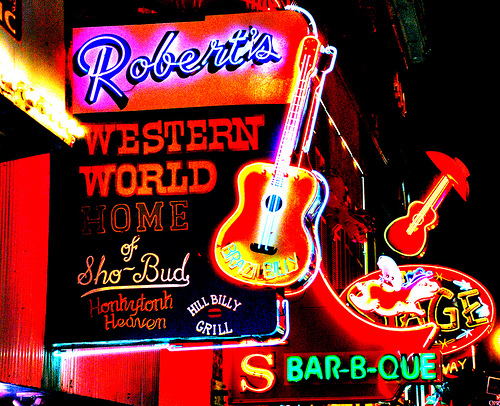 Robert’s Western World is a haven for country music. It has live music, a grill, a bar, and lots of neat artifacts to see. You can even take kids there up until 6 pm. Big Bang Dueling Piano bars are in a couple cities, and there’s one in Nashville too! And finally, there’s Country Music Hall of Fame! Come if you’re obsessed with Johnny Cash, stay and look at pictures of Dolly Parton’s…dress. Nashville Nightlife — that’s alliterative! We’ve talked about how Nashville’s famous for its whiskey and bourbon. If you’re downtown and looking for high-quality cocktails, check out Skull’s Rainbow Room. And if you’re into underground places few people know about, there’s Old Glory. It’s so secret it doesn’t have a website or even a sign on the door! Let’s crawl ya’ll! The Music City Pub Crawl is a popular pub crawl for only $15 per person. 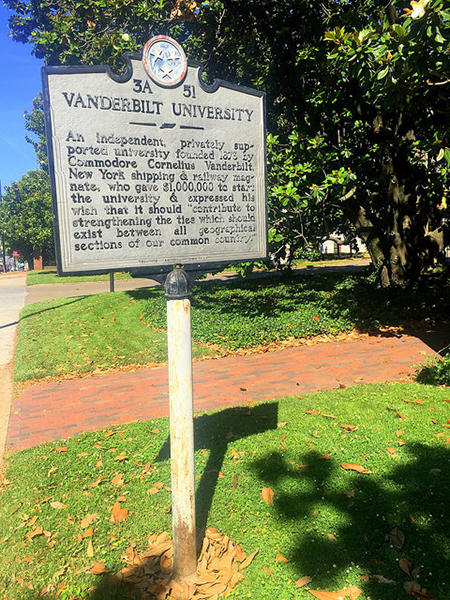 It’s a two hour long guided walking tour through the heart of downtown Nashville along 2nd Avenue. You’ll stop at a bunch of bars, so it’s a great way to gauge which might be your favorite going forward. Who doesn’t love Happy Hour deals? This is a list of Nashville’s best Happy Hours. Check out Sambuca’s 3/4/5 deal if you’re into getting drunk while spending as little money as possible. Perhaps not as safe as you’d like, but what place on Planet Earth is? Nashville scores a 7 on the crime index. For reference, 100 is the best. So, not great, but like any city, it just means you need to know the areas to avoid. Here’s a crime hotspot map. The bluer the better (more alliteration). If safety is your top priority, search for apartments in West End or 12 South and tries to stay away from East Nashville. This thread on Tripadvisor has some great input on the safest areas of the city from some people who’ve lived there. Esri.com’s ziptapestry tool lets you explore demographics of each zip code to get an idea of each neighborhood. 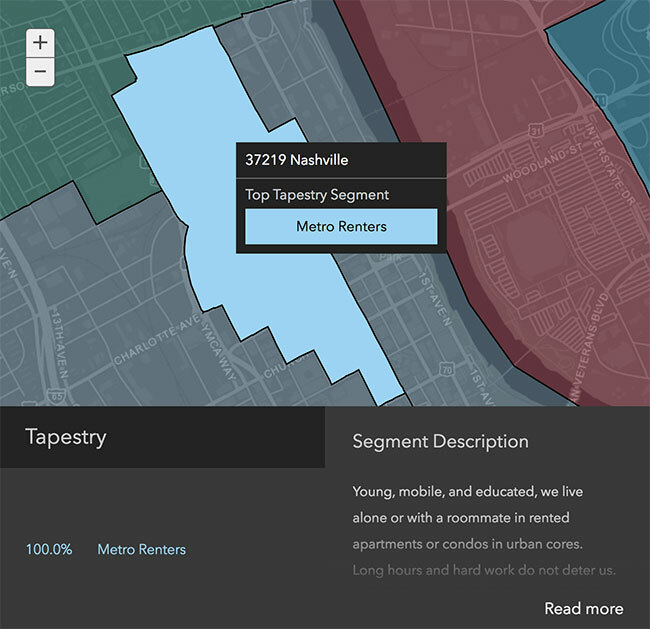 In our example, plugging in the zip code for Nashville (37219) breaks down the dominant types of people living there. How awesome is that? Feel free to check your own neighborhood while you’re at it! Yeah, it’s in the south, but Nashville still gets cold. Temperatures in January can get as low as 27 degrees. So you’ll definitely need a heated apartment. Surprisingly, the highs in July rarely get above 90 degrees! Even so, you should probably look into a place with AC. 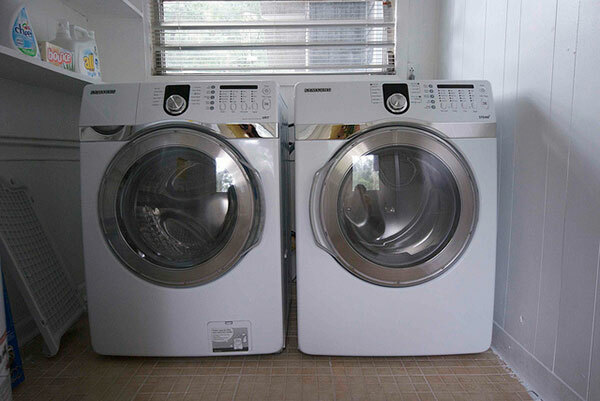 Laundromats aren’t hard to come by, but if you’re planning on going without a car, a washer/dryer is a must have. You’ll also want to factor things like utility bills into your budget when looking for places to rent. Here are some good websites to find apartments. Use the sort functionality to drill down on your desired number of bedrooms, budget, etc. It might surprise you, but Craigslist is actually a very useful site in finding apartments (especially places whose owners/landlords are desperate to rent out). These are things you should know before moving so that a landlord can’t hoodwink you. Under Tennessee law, landlords must tell tenants certain information (usually in the lease or rental agreement). This includes the names of anyone authorized to act on the landlord’s behalf and whether the landlord may enter to show the place to prospective renters during the last 30 days of the tenancy. 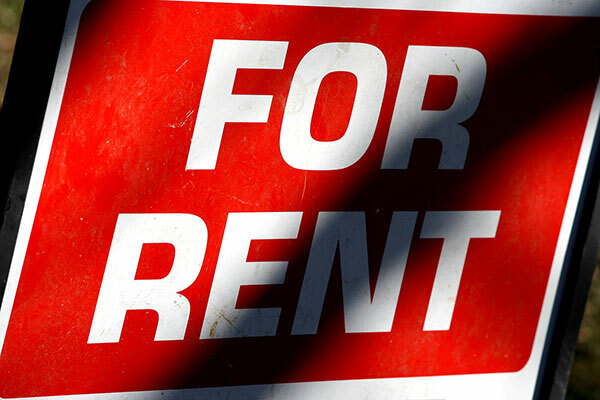 Tennessee Required Landlord Disclosures. Hopefully, it doesn’t come to this, but tenants can sue landlords for the return of their deposit, up to $25,000. There is no limit in eviction suits. Filing a Security Deposit Lawsuit in Tennessee Court of General Sessions. For all sorts of other good information about lease laws, check out State Landlord-Tenant Laws. Between 2017 and 2018, average rent in Nashville has decreased by 2.25%, which is a lot smaller thant the 4.83% decrease the United States as a whole experienced. Fortunately, vacancy rates in Nashville are in a better position, sitting at 4.87% which is a 0.88% increase from the previous year. Overall, the rental market in Nashville isn’t great, but things are showing signs of improvement wiht rent prices (gradually) dropping and new developments increasing the vacancy rate. There are a couple of things to keep in mind with respect to your timetable finding an apartment. Obviously, it helps to start looking as soon as possible. Leases usually begin on the first day of the month, so you should start looking two weeks before the start of the month you want to move in at the very latest. Nashville has a pretty sizable college population, so many leases will be ending in the spring, probably May 31st. If you can, the ideal time to start looking for apartments is in April or early May, and be ready for a June 1st move-in. You’ll absolutely need your Social Security number when applying for apartments. Landlords and realtors will almost always run a credit check on you and any roommates. Many will also ask you for a pay stub as proof of income. As for deposits, most landlords will require the first month, last month, and security deposit (equal to one month’s rent). For example, if the monthly rent for an apartment is $1,000, you’re probably looking at paying the landlord a deposit of $3,000 upon signing the lease. This will cover your first month’s and last month’s rent, and you’ll get the security deposit back minus any catastrophic damages you cause to the place playing pong with your friends. Just in case the city life is too much fun for you. First things first: there aren’t trains in the city like there are in New York. If you’re living in the suburbs you absolutely will need a car. The nicest suburb of Nashville is Brentwood. No, not that Brentwood. It’s a half an hour away from the city, but remember how bad traffic can get at rush hour. Like most hoity-toity suburbs, it has beautiful Tudor style homes and large yards. It has TONS of parks, so hiking, biking, and picnics are always an option in Brentwood. The Brentwood Town Center is also a go-to place for shopping and groceries. You can look for homes in Brentwood here or find other super desirable suburbs here. Now for the real fun, moving! If you want to get an idea of the cost of different moving services, check out our moving cost calculator. If you’re moving from afar, you also may want to have a glance at our moving out of state guide. A few other things you’ll want to keep in mind. Moving Permits: Moving to the city is always difficult because of thin roads, sidewalks, and constricted space. Make it easier on yourself and get a permit for parking in a loading zone. It’s only $15. A very important thing to remember when moving to Nashville: Traffic gets very bad between 4 pm and 6 pm. Plan around this and do not attempt to drive a moving truck during these hours. If you’re reading this you probably appreciate a speedy internet connection. Great news! Google Fiber is coming to Nashville, so prepare to watch Game of Thrones at lightspeed. Driver’s Licenses: If you’re from out of state, you must apply for a TN driver’s license within 30 days. You can find out how to do that here. Vehicle Registration: find the steps for registering your vehicle here. It costs $9 and can be somewhat complicated, so give yourself some time. Trash & Recycling: The city handles trash and recycling. Collection days vary by neighborhood. Find yours here. Ways to meet people: there’s always tons of ways to meet new people. One great way is to use meetup.com. The /r/Nashville page on Reddit is also a great place to search for upcoming events and find lesser known tidbits and activities. What’s The Cost To Move In Nashville?